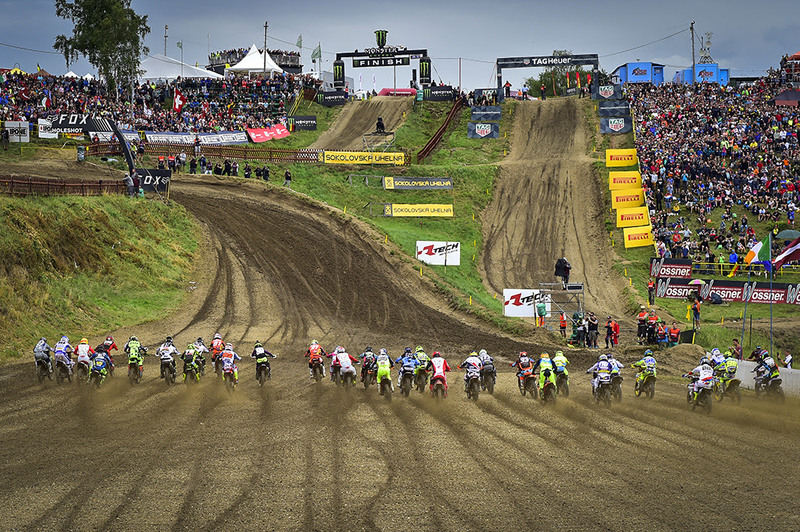 The FIM Motocross World Championship is back in action this weekend at the iconic Loket circuit in the West of Czech Republic. After a week off the bikes, riders, and teams are back in Europe and ready to continue their 2018 quest at the MXGP of Czech Republic, the 14th round of FIM Motocross World Championship. Over 11,000 kilometers separates this weekend’s circuit from the last stop in Semarang, Loket is a traditional style of motocross track with massive and natural elevation change surrounded by nature with a castle for a backdrop. The venue will host the hottest of title fights between Red Bull KTM Factory Racing’s MXGP stars Jeffrey Herlings and Antonio Cairoli and their MX2 Red Bull KTM counterparts Pauls Jonass and Jorge Prado. Adding to the weekend of World Championship racing is the FIM Europe classes of EMX300 presented by FMF Racing, EMX85, and EMX65. The EMX300 class boasts an entry list of over 45 riders including Verde Substance KTM’s Brad Anderson, GL12 Racing’s Mike Kras, Greg Smets, and Czech Republic’s own Vaclav Kovar. The future stars of motocross also line up in EMX85 and EMX65 for their unique event to crown European Champions. 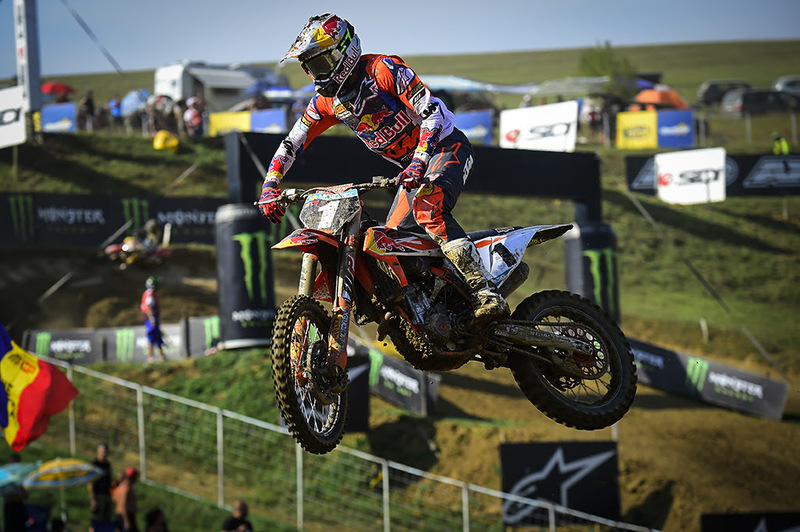 Heading into the MXGP of Czech Republic Red Bull KTM Factory Racing’s Jeffrey Herlings has again extended his points lead after missing round 11 of the series with injury. Herlings now has had an additional week to return to his top form and leads the points chase by 24. Loket has been a place of up and down results for the Dutchman with 2 MX2 overall wins, a 4th in MXGP last year along with a 2nd in 2011 and an 11th in 2010. Red Bull KTM Factory Racing’s Antonio Cairoli is last year’s MXGP of Czech Republic winner and has been the main competitor to Herlings all season. The pairs’ battles have captivated the fans, after a week of rest and recovery many hope the Sicilian will return to winning form this weekend. 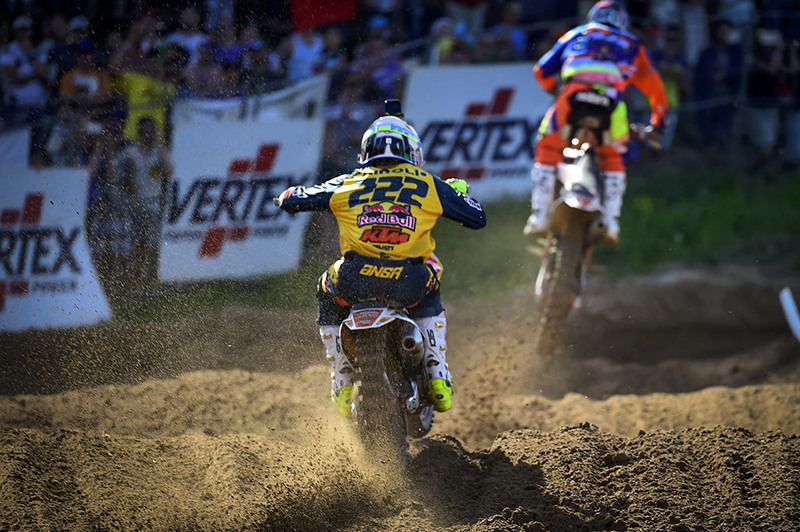 Aside from last year’s win Cairoli has claimed Czech victory on 3 other occasions and reached the podium 4 more times. Monster Energy Kawasaki Racing Team’s Clement Desalle is the only other rider to win a Grand Prix in 2018 and may be able to repeat the performance this weekend. Desalle has been able to win on the soil of Loket 3 different years and was a close second last season. The hard soil and elevation change is also not unlike that of Russia’s Orlyonok circuit which hosted his lone win earlier this year. Taking over 4th in the championship standings after strong racing in Asia is Team HRC’s Tim Gajser. Gajser has been raising his level and battled for race wins at the last round. No stranger to winning the 2016 MXGP champ has been absent of the podium on several occasions earlier this year and will be looking to keep his Honda at the front. Loket is one of Gajser’s closest GP to home where many TG243 fans will make the trip to watch their MXGP idol who has been on the podium here the last two visits. On a mission to rebound from what was arguably his worst weekend of the year is Monster Energy Yamaha Factory MXGP’s Romain Febvre. Febvre was looking extremely fast mixing it up at the front of the pack in Asia before crashing out of MXGP race 1 and falling on the start of race 2. Febvre’s misfortune was likely temporary however seeing the prior GPs were consistent improvements over his early season. Febvre was 6th last year, 3rd in 2016 and won the Czech GP in 2015. Other riders to watch include Rockstar Energy Husqvarna Factory Racing’s Gautier Paulin and Wilvo Yamaha Official MXGP Team’s Jeremy Seewer. Paulin has 1 victory to his belt from Loket while Seewer was second overall in MX2 last season and the year prior. MXGP Championship Top Ten: 1. Jeffrey Herlings (NED, KTM), 583 points; 2. Antonio Cairoli (ITA, KTM), 559 p.; 3. Clement Desalle (BEL, KAW), 447 p.; 4. Tim Gajser (SLO, HON), 410 p.; 5. Romain Febvre (FRA, YAM), 400 p.; 6. Gautier Paulin (FRA, HUS), 389 p.; 7. Glenn Coldenhoff (NED, KTM), 329 p.; 8. Jeremy Seewer (SUI, YAM), 295 p.; 9. Jeremy Van Horebeek (BEL, YAM), 280 p.; 10. Maximilian Nagl (GER, TM), 227 p.
The MX2 Championship is just as strongly contested as that of MXGP and is now tied between the Red Bull KTM Factory Racing riders, Pauls Jonass and Jorge Prado. Each hold 550 points but while Prado has more overall GP victories Jonass still claims the red plate with more race wins. Jonass will be especially interesting to watch this weekend with the pressure for the title on a track that has taken its toll on the Latvian. Last year Jonass took the overall win but ended his season here in 2016. Jonass was dominant early this year but since has had to work through some up and down performances. On the other hand Jorge Prado has been strong nearly every weekend with the main exception coming from the season opener in Argentina. Prado has been able to match the pace of Jonass if not beat it on many occasions and with the help of a long list of Fox Holeshots is the reigning champs biggest challenger. Prado has his only professional result at Loket coming from last season where he took 5th overall. Rockstar Energy Husqvarna Factory Racing’s Thomas Kjer Olsen and Thomas Covington have been the thorn in the side of both Jonass and Prado. Each of the Husqvarna riders have put themselves between the title contenders as they strive for their own wins. Olsen and Covington both have seen success this year however neither have done to well in Loket with the exception of Covington’s podium last year. Perhaps the next rider to claim his career first win is Kemea Yamaha Official MX2’s Ben Watson. Watson has consistently been one of the fastest riders in the MX2 category but the results haven’t quite shown such. Watson’s start struggles seemed to have been remedied at the last two rounds but he was still unable to have a standout performance. Watson has 2 overall results in MX2 from Loket with a 22nd last year and a 20th in 2015. Making his way to the front of everyone’s minds after winning the MXGP of Indonesia is Team HRC’s Calvin Vlaanderen. While Vlaanderen reached the podium prior in the season few were more impressive than his back to back Asian performances. Vlaanderen’s three previous results from Czech Republic can be expected to be improved this weekend with 16th in 2017, 23rd in 2016, and 17th in 2014. MX2 Championship Top Ten: 1. Pauls Jonass (LAT, KTM), 550 points; 2. Jorge Prado (ESP, KTM), 550 p.; 3. Thomas Kjer Olsen (DEN, HUS), 422 p.; 4. Ben Watson (GBR, YAM), 412 p.; 5. Calvin Vlaanderen (NED, HON), 369 p.; 6. Thomas Covington (USA, HUS), 331 p.; 7. Jago Geerts (BEL, YAM), 286 p.; 8. Michele Cervellin (ITA, YAM), 255 p.; 9. Henry Jacobi (GER, HUS), 223 p.; 10. Davy Pootjes (NED, KTM), 218 p.